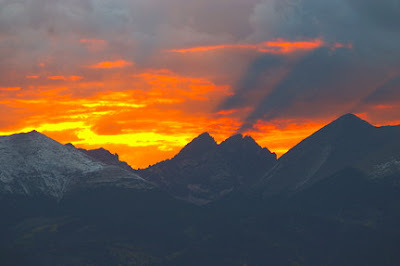 • What could be romantic than coming from Texas to Colorado and proposing marriage on a mountain peak? How about getting lost on the way down? That sure will test your compatibility! • Do you wonder why you see more of some birds and fewer of others during the winter? Cornell University's annual Winter Bird Highlights is available for download. It is a PDF file (2.2 MB). • Our favorite wildlife rehabilitators (now in their third decade at that site) were profiled recently on a Colorado Springs television news show. There is video this year's bunch of bear cubs too. • I was outside yesterday and heard that sound — southbound Sandhill cranes passing overhead. I have two memories associated with it — one good, one sad. The sad one was walking down a crowded sidewalk on the Colorado State University-Pueblo campus when a flock was passing overhead and not one person looked up, except me. Should I have turned into a sidewalk bird evangelist, exhorting the students to connect? On the other hand, one October morning when I was new to the volunteer fire department, we were doing some engine maintenance outdoors on the concrete apron in front of the fire house. A flock passed over on the same flight path as yesterday's, and those stopped to watch. So I figured that they were all right. I took a break this afternoon to walk up one of the nearby roads. The sumac is turning red already. It can't wait. Somebody always wants to be at the head of the line. Saturday night when we ate supper on the porch, not a single hummingbird came to the feeder. "It's like they have a calendar," I said. 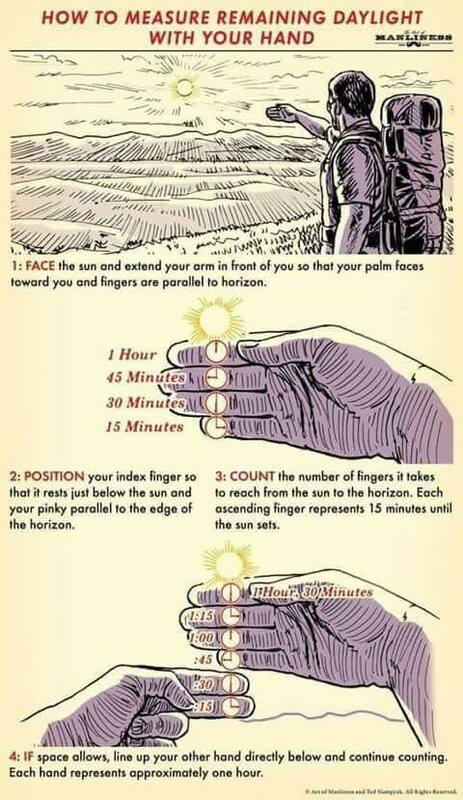 "They know when it's the equinox!" Ah, the Calendar of Nature. And then last evening one came by — it's always a female broad-tailed — proving that, as usual, not every individual reads the manual. Just watching the seasons change and the forests change. Burned in 2012, reseeded with grasses 2013; now the oak brush is taking over. Nearest slopes (where the oak brush is turning) burned in 2011. Labels: autumn, fire, Wet Mtns. When you put too many horses on your little acreage, and they eat the grass down to the dirt, at least it is easy to dig hand line around the brush fire that you started by dumping wood ashes during the driest autumn in fifty years, you dummie. I am tired of blogging about the fire, and I need to clean my desk — the whole room, in fact. So visit The Mallard of Discontent and read Chad Love's updated "Hallowe'en screed" with Ray Bradbury references. Steve Bodio offers additional commentary. Today was sort of like a bad dream. Maybe not a bad dream, but more like one of those "stuck in a loop, can't do anything" dreams. I was working on an editing job when the phone rings, and it's a friend whose home was threatened in July by another forest fire. She was seeing smoke, a big column. Her neighbors were seeing smoke. I called the sheriff's office, but the dispatcher had no reports and no reports of controlled burns either. So I took a radio and binoculars and drove about three miles to where I could see the area in question. No smoke was visible. I called the dispatcher again, on the radio this time. "FIre," he said. Nearby Town's department was en route, staging on County Road Such-and-such, and requesting assistance. I asked him to activate the fire siren and dashed home, asked M. to call our friend back, put on my Nomex clothes, grabbed my fire pack, stuck the magnetic red light on the Jeep, and headed back to the fire house. Two issues were in play. 1. It's policy that no fire truck rolls out of the house without at least two firefighters on board. This is a good policy. Even the little brush truck requires one person to watch the pump and/or drive while one or more firefighters advance a hose line. 2. For those (like me) who cannot hear the siren up the canyon, we rely on a telephone-tree system to notify firefighters. I checked with couple of the lead callers. They said that X, Y, and Z were at work. L and M were not answering their phones. E and F were moving cattle and not in cell-phone range. D was putting up hay two counties away. G was at a meeting up in the county seat. And so on. Meanwhile, Nearby Town's brush truck went tearing up the road past the fire house, followed by a Bureau of Land Management brush truck. They waved to me as I stood in the open bay. I felt sort of useless. Then came Nearby Town's bigger wildland engine, driven by the chief himself. I waved him down (and briefly considered asking for a ride). They had abandoned the idea of staging on the first road and were now headed up this one. Off they went. I kept feeling useless. I waited. Various communications and non-communications ensued. The dispatcher said that County Seat's fire department had been "toned out," i.e., notified of a fire, and did I want them to come or should they stand down? Cautiously, I suggested that they stand down. If I was wrong, that could be bad. I'm not the chief or anything. And where was he? (Answer, probably off working thirty miles away.) Such are the joys of accidental leadership. Then here came Nearby Town's two engines, down the road, lights and sirens going, turning onto the state highway — what was that all about? Finally two of our guys arrived. Better late than never, I started the brush truck and off we went. The dispatcher said that Nearby Town had a structure fire in progress, which explained the rapid departure of their apparatus. We started up into what I previously called Something Creek Estates, one of my least-favorite areas in terms of wildland-interface fire potential. Up and up we went, pausing at times to look at tire tracks in the dirt, trying to trace the traffic patterns. There was some chatter on the federal radio frequency: something about "up on the ridge" and "tell Pueblo" and "false alarm." Then we saw the green BLM engine coming down. We pulled alongside. Its crew of healthy young firefighters was beaming. One guy with chin whiskers looked right out of Two Years Before the Mast. What fine specimens of wildland firefighters! Yes, the driver said, that had been them on the radio. It was a false alarm. 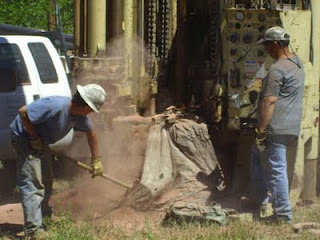 A water well-drilling rig at a home site up on a ridge had kicked up a tall column of dust. Just look at the photo above and visualize lighter-colored dust — lots more of it. Nearby residents who had experienced a lightning storm four nights before had imagined the worst. Twenty minutes later I was back at the firehouse filling out the incident report. You always have to do the paperwork. I had just enough time to come home, change clothes, and take Shelby the dog to her appointment at the vet for an abscessed insect sting or whatever it was. There went the day. How Do Our Dogs Get To Be So Old? 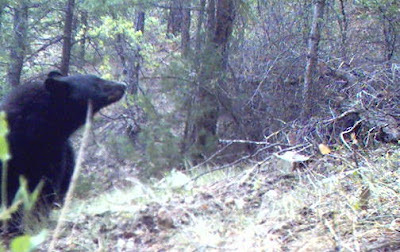 Last year Shelby, although arthritic, charged a black bear and made it run. This morning, coming back from our walk, she slipped a little on the stairs up to the veranda, one leg down between the open steps, and had to muscle herself back up with her forelegs. And she does not want to "sit" for treats anymore. She just sort of shuffles her hind legs. "Do I have to?" Then I read "Geezers," one of Tom Reed's latest posts at Mouthful of Feathers. Like the surprise that is autumn—the suddenness of things that happen while you are living it instead of watching it—I’ve found myself with a herd of old dogs. "Black body" — a black bear in infrared light. Two scout-camera bear photos from late August. The top one was taken just inside the adjacent national forest, while the bottom was in infrared shot in a gully that runs through our property. Although the upper photo's bear is out of focus, I think I caught it sniffing suspiciously before it came over and batted the camera, which was on the ground, propped up with rocks, and aimed downhill along a game trail. And why was it on the ground? Because a bear broke the bracket for the tree strap. I need to make a new T-post mount for it. All well and good, but this looks like another tough autumn to be a bear. I walked one of my favorite nearby trails this morning and I hardly saw an acorn on the Gambel oaks. When I thought it did, it would just turn out to be one of those pale galls (some kind of wasp makes them) that are the size of a small grape. There were acorns forming in the spring, but they vanished during the hot, dry summer. Fell off? Eaten while immature? 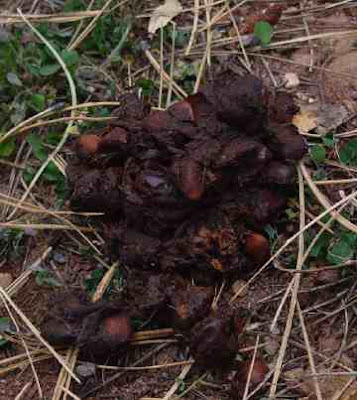 There were wild plums — they are all gone now, and bear turds full of plum pits lined the county road last week. One was so huge and symmetrical that it could have been entered in the state fair's animal-poop exhibit — if, of course, there were such a category. But hardly an acorn. How is a bear supposed to bulk up? A couple of evenings ago, after dark, M., who was outside, heard two shots from down the road. My first thought is always, "Oh no, someone found a bear in the garage/garbage can/wherever and just executed it." Later, about ten o'clock, we took the dogs for their before-bed walk. Passing a little cluster of houses where the shots might have originated, we heard a couple of large bangs, like someone smacking something metal. A couple of porch lights were on, but nothing else. No voices. 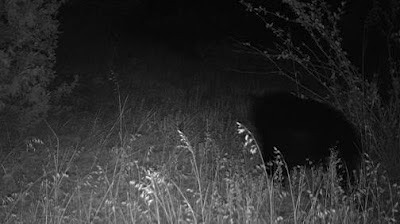 I carry a large Maglite flashlight at night, and I shone it around from the shoulder, cop-style, but what with bushes and trees in the way, could not see any movement or eye-flash. The breeze was not helping — the dogs did not appear to smell anything. So had a bear been around earlier too, and someone tried to scare it off? If so, it did not get the message. Sunset shadows over Crestone Needle, Sangre de Cristo Range, 8 October 2010. A cold front rolled down from northern Colorado, and M. was hinting this morning that a "quick blast of fire" from the wood stove might be nice. So I built a fire, the first one of the season, which had an official "end of summer" feel to it. "It's a sad occasion," M. said, as she prepared to do some yoga in front of the bright orange light from the Pyrex windows. Then she recalled that she had built the first fire last year on September 9th during a spell of cold, rainy weather. This year's fall season has been warm, and it may warm up again. As a matter of religious principle, however, I never turn on the furnace until the 1st of November. Meanwhile, there is some discussion of bread-baking today. Our bears have moved on from eating squawberries to finishing off the last of the wild plums, to judge by this evidence. 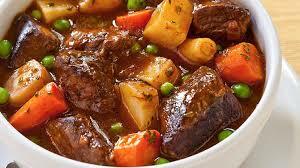 Those lighter brown lumps are plum pits. They came out on about Oct. 9 this year, as the Gambel oaks turned egg-yolk yellow and tan: tiny midges (?) with a tuft of greyish-white fluff on their butts. 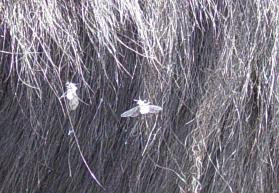 Right: "Ash bugs" on our dog Shelby's coat. They fill the air like bits of falling ash. "Goddamned ash bugs," M. says, stomping into the house. "One flew into my mouth, and one went in my eye. And they're in my hair. Sheesh!" Down in Rye, meanwhile, there was some real ash in the air. 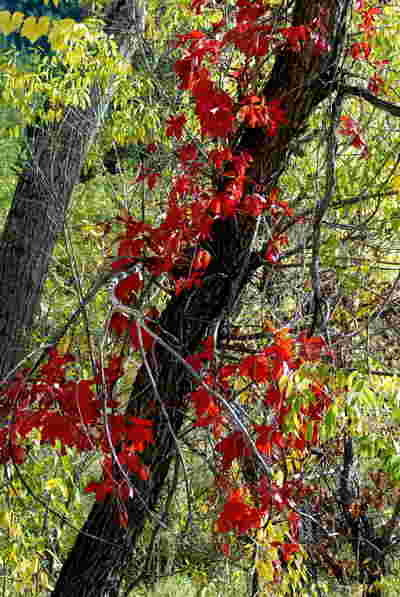 Southern Colorado fall color: Virginia creeper growing in the willows along Hardscrabble Creek. More at the Pueblo Mountain Park blog. No one can resist. The photo shows aspen trees among the conifers in the Wet Mountains of southern Colorado on Monday, October 2nd. The following day a little squall line of thunderstorms came through and ripped off most of the golden leaves. The same thing happened with the big willows and cottonwoods along our road. One Forest Service ecologist said the causes were drought, increasing grazing by both cattle and elk, disease, and insect infestations. I am surprised no one has mentioned fire suppression. Around Cripple Creek, for instance, so many aspen groves along Colorado 67 clearly represent little 19th-century forest fires, probably started by sparks from steam locomotives back when today's state highway was a railroad grade. How many of the aspen groves we are used to seeing resulted from 19th or early 20th-century forest fires, before the era of serious fire suppression started mid-century? 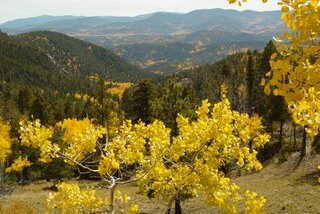 When some acquaintances of ours, who live amid thick firs in the Sangre de Cristo Range near Westcliffe, did a massive tree-thinning to protect their home from wildfire, suddenly they had aspens! The last time I was there, the area around their house was full of knee-high aspen. Will they make it to maturity? That seems to be part of the issue. Because aspens take advantage of the regenerative opportunities provided by forest fires, Skinner emphasized that the only real solution to their regrowth in the region would be less fire suppression.